Ahem – 9 months or so – that’s pretty poor. So, new year, new start, and, most importantly, a new laptop – this should mean it doesn’t take me 12 hours to actually get any post online. I’m going to jump right in with what I’m doing right here, right now, and then maybe trawl back through some finished stuff from 2015 later on to catch up. Remember the Onion Jumper? 14 shades of yellow, 15 shades of brown and green – dyed with yellow and red onion skins. I made a start on the knitting during lambing last April, and then put it away to work on other projects… the kiss of death to anything. Anyway, after the Christmas gift knitting craziness, I always feel the need to work on something just for me, and so I picked it up again at the beginning of this month. I’m not very good at writing notes (no surprise there then! ), so did spend some time trying to remember a few vital details, such as the needle size (3.25mm) and the colour changes (every round for the yellow, every 3 rounds for the green). I suppose I never really intend to leave a project languishing for this long and of course always feel I’ll certainly remember what I was doing. Since restarting, I’ve knitted the body from the bottom to the armpits, and I’ve started on the sleeves. Oh man – the sleeves! Really starting to regret changing the colours every round for these. I’m spit splicing all the ends, and that is a lot of splicing! I’m knitting both sleeves at the same time on 2 circular needles. Despite having painted the ends of one needle with red nail polish, I’m still beginning many rounds with the wrong needle and having to re-jig everything. I suppose with the colour changes, the pattern (centred, so not starting at the beginning of the repeat), the sleeve increases, and the constant “help” from our puppy (a post in itself), it’s just too much for my old brain to cope with! So, I’m finding the sleeves s.l.o.w., and can’t wait to get onto joining the arms and the body for the yoke. I passed the half way mark last night, so some progress I guess. I decided when I restarted this project that I’d work it as a raglan. I completed a couple of top down raglans over Christmas and I like the shape. It would have made more sense to knit this top down too, but I didn’t. This meant working out how long I wanted the sleeves, then counting back so that both the colour repeat and the pattern repeat for the sleeves end at the same spot as on the body. Only time will tell if the maths has worked! My hope is that the fairisle pattern will look good with the raglan decreases – I haven’t done any sort of swatching for this, so I’ll have to wait and see on that too. I could have worked the original pattern as written of course. Or I could have spun two big balls of yarn with long colour graduations to save all the splicing. Or I could have knitted the jumper top down. Any or all of these would have made this knit much easier! 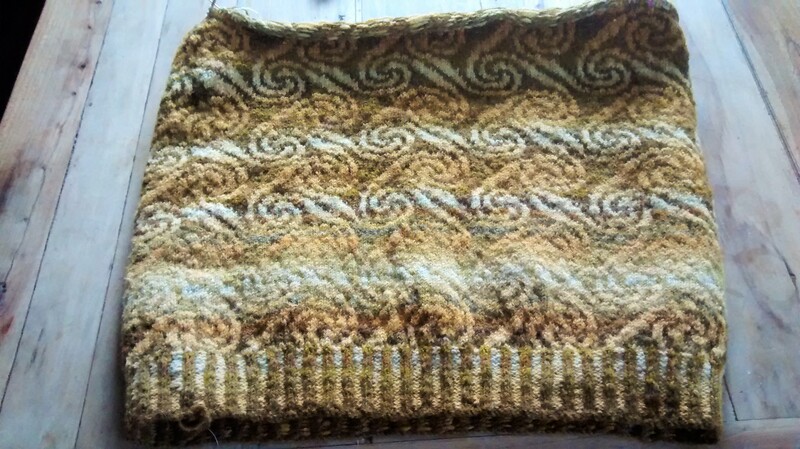 Having got to the stage where I almost always spin with a project in mind, I really should make an effort to design my knitting before I cast on! The destination would be more predictable, although the journey may not be quite as exciting. Okay, this didn’t take too long to write. I’ll show some of my Christmas knits next time. Maybe it won’t take me another 9 months! 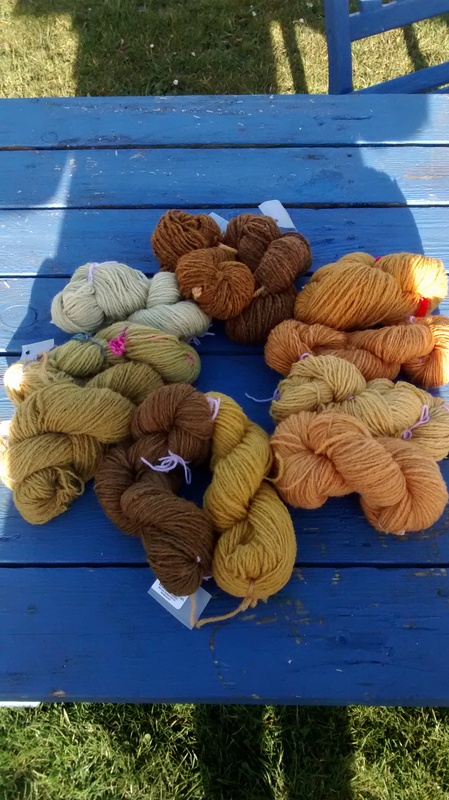 After what will henceforth be known as the Great Buddleia Disappointment, I decided that my next natural dye experiment would use something sure to give me a result. Enter the humble onion skin. Onion skins are often referred to as the “beginner’s dye”, as it’s pretty tricky not to get a result. My dye book catchily entitled Natural Dyes, Fast or Fugitive, (which is actually a cracking little book bursting at the seams with proper scientific research, rather than anecdotal hit-or-miss experiments) gives onion skins, even on alum mordanted wool, a light-fastness rating of 1 – dyes that faded rapidly after only one Standard Fading Period. I’m not too worried by this – weld also has a 1 rating, and that’s been used for hundreds of years as a fail-safe dyestuff. I imagine that anything I knit will mostly be worn either in the winter, when strong sunlight is but a distant dream, or after dark around the campfire on summer evenings. Another consideration is that I achieved some fairly full-on colours, and I may be glad of a little fading. So, to dye my wool, I used my usual method: onion skins in tights; boiled up in the slow cooker; 1 tsp alum and 3/4 tsp cream of tartar dissolved in the dyebath; wetted, scoured fleece added; whole lot simmered for an hour then left to cool. I used a ratio of 2 parts skins : 1 part fleece by weight – in this case I started with 120g of onion skins and added 60g of fleece. My first batch was a lovely rich orange – like the yolks of our grass-fed hens’ eggs. I continued with another 60g fleece (keeping the package of skins in the dyebath all the time). A slightly lighter orange this time. In total this 120g of onion skins gave me 11 dyebaths, and dyed the fleece a spectrum from orange to a buttery yellow. I added another teaspoon of alum / CofT every 3 baths or so. Next, I moved on to red onion skins. We don’t use red onions as much as yellow here, so my stock of red skins was sadly lacking. As luck would have it, supermarket trays of red onions are awash with skins that have fallen off, and the staff in the vegetable section are more than happy for you to unburden them. The added advantage of doing this is that my children now avoid accompanying me to the supermarket. Apparently I “come across as a bit of a nutter”. Bonus. No campaigns for mascara and chocolate on my trips any more. My first batch with a 2:1 dyebath came out brown. Subsequent exhaust baths took me through several pleasing shades of green. I got 5 baths from the red skins before the colour became too light for my purposes. High on onion fumes, I then repeated the entire process with grey fleece. The result here was lovely – tones of orangey-brown very reminiscent of Harris Tweed. I will do the same with red skins on grey, and then call it a day. It proved almost impossible to capture the colours inside, and the high winds we’ve been having here make taking outside photos of wisps of fleece a foolish quest, so here is a picture of the only skeins spun so far. I have a lot of onion dyed fleece. Some might say too much. But I have a plan. An Onion Jumper. A fairisle extravaganza using only onion dyed wool. During the carding and spinning process I’ve been pondering on the design of this garment. I toyed briefly with my daughter’s suggestion to knit pictures of onions. 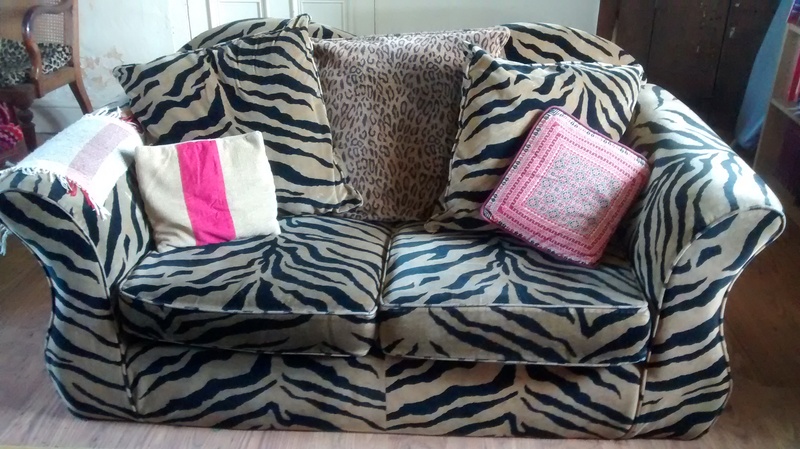 The last time I took style advice from a child we ended up buying this sofa. I’ve lived with it (and with the impossibility of creating any sort of stylish room when this is the dominating feature) for 14 years now. I have since made a conscious decision to disregard anything that a teenager thinks is “cool”. Next, I played with some leafy designs. The colours are certainly reminiscent of autumn leaves, but in the end I decided that this was a bit of a cliché, and might look a bit out of place out of season. 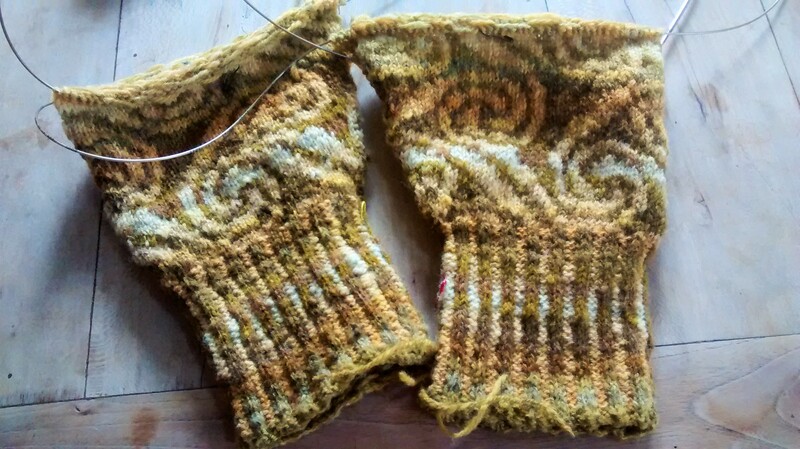 I think I have settled on this – the Donegal Celtic Spiral sweater by Alice Starmore. The spiral design is a small nod to the onion-ey origins of the dye without being too pictorial. I’ve also always loved this sweater, and have always planned to knit it someday. I’d like to have the yarn ready to knit in time for lambing. I help my parents every year which means that I spend long days and nights sitting in a caravan waiting for the ewes to get their act together. I usually plan a decent knitting project for this “holiday”, and this should be just the ticket. It’s a lot of yarn to spin, and I’m pretty busy with other life stuff at the moment, but I will try my best. I’m trying to spin a colour a day, and I have 16 days ’til the Easter hols. We’ll see.